Ger Bemer was born in Maastricht, the Netherlands in 1949.He studied Chemical Engineering at Eindhoven and Delft Universities and thereafter joined Unilever's food business in 1979. He has since held various positions in R&D, Supply Chain and General Management in the Netherlands, Kenya and Brazil. He was responsible for introducing TPM in Unilever's Ice Cream and Frozen Food Business Europe from 1998 to 2001.In 2001 he joined Royal Nedalco as CEO. Royal Nedalco is Europe's second largest producer of natural ethyl alcohol which is an important ingredient for the beverage, food, pharmaceutical, cosmetics and chemical industry. TPM was introduced in Nedalco in 2002. Nedalco is part of the food and food ingredients group Cosun and TPM has subsequently been introduced in all five companies belonging to the Cosun group. TPM Club India was founded in 1998 and since then Rajesh Parim has dedicated all his efforts to advocate TPM in Indian industries. His responsibilities include the management of the club activities, organizing conferences/seminars and promotional events. Jean Muller started his TPM experience at the Mouzon plant in France which won the TPM Award in 1999. Since then he has been head of TPM implementation at several plants and the activities influenced among other plants. At the present he is responsible for the development of TPM at plants in the USA. Mr. Loftus has been active in TPM interpretation since 1995. He has served as an interpreter to TPM consultants and instructors in 17 countries for consulting visits, training courses, TPM Awards Assessments and conferences. 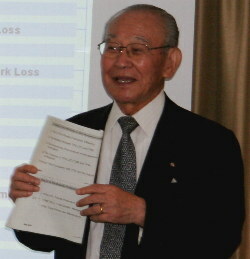 He has also many translated and published books on TPM and other Japanese management issues. Ms. Miyoshi has been involved in TPM interpretation since 1991. She has been active in TPM Awards Assessments and consulting visits of TPM consultants in more than 60 factories in Europe and Asia. In addition to these visits, she has also been active in interpreting at TPM conferences in Europe. Henk Eertink has been contributing to TPM development at Unilever Europe for many years.